My husband and I are between homes and living on a boat in The San Juan Islands. Our home of the last seven years in Seattle is on the market. We left it looking picture perfect for a remodel project that we go to every day, on island. First we fell in love with the island, and then with the property: a sloping side of old growth forest on a quiet bay. The house itself was hideous, but we knew we could do something with that. “There never has been a house so bad,” noted Elsie de Wolfe, “that it couldn’t be made over into something worthwhile.” Elsie was the woman who practically invented Interior Design. But back to the land. Afterall, it’s all about the land and the sea. That’s what calls us here and holds us here. We reimagine our lives with each move. My philosophy in moving–I’ve moved often enough in my life to have developed a philosophy–is to create a zone that I can go to initially, where everything is ideal. I can’t tell you how often these “rooms” have been outdoors. In San Diego I found a shady spot out back under a trellis draped in grape vines where I contemplated growing everything in mossy, old world pots. It was my sanctuary. And when all the house was covered with drop cloths in the tumult of renovation on Mercer Island, the deck was what pulled me through. Out there I saw how well the orchid plants were doing, resting on the rail overlooking the lake after their cross-country move in a truck. We had flown in, how could I complain? Here, I created my zone by carrying up rocks from the beach and building a fire pit in a clearing. 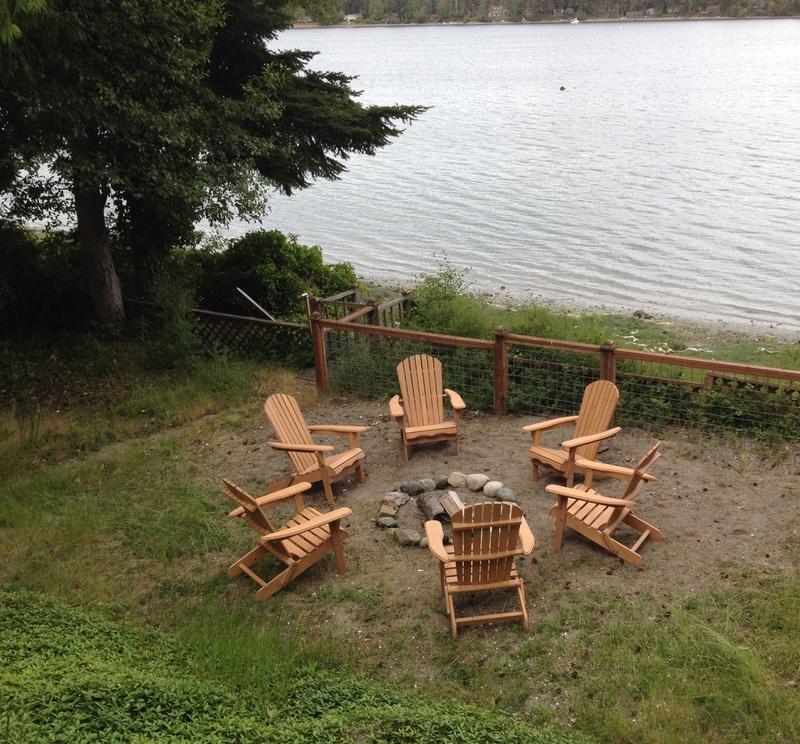 Around that I envisioned a circle of cedar Adirondack chairs. It was as simple as that and we built it. So our pow wow is up and ready, long before the house. This is where I sit under the cathedral of trees and remember why I am here. I will learn the bird calls by day and find my way among the stars at night. And it will all be so clear. Everyone has their own immigrant story, but at one time we were all indigenous people somewhere. Come, count yourself among us. It is good to have a picture though the one in my mind is not so different. Your last three paragraphs are beautiful. Something grates across my mind, however, with the commercial word Adirondack. Everything else is so naturally essential. Maybe it’s just a West Coast/East Coast thing. You’ve seen Sweetbriar. The Cedars are there. Maybe all that is missing are the Adirondacks? The comfort’s in our minds–a state of being. I wish I was being there. Many thanks, everyone. I can see we are going to have to build more chairs… (By the way, Alexander, an Adirondack chair is not, to my knowledge, a brand but a style of chair. Vastly comfortable, with arms like tables, as pictured. The perfect chair for the porches at Sweetbriar too).